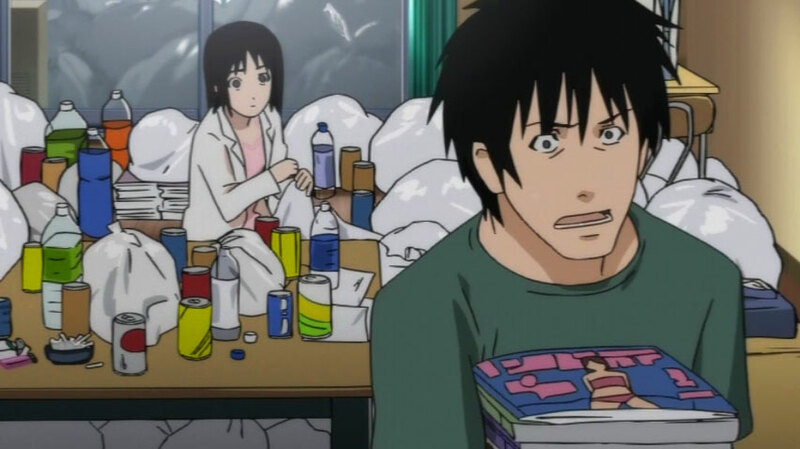 Over the last couple of months I have been watching the new-to-me anime series Welcome to the NHK, and loving it. The story is the best part about the series and the premise is entertaining in an "it's funny 'cause it's true" kind of way. 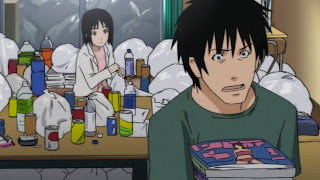 Once you take away all the superficial content, some of which can be on the gimmicky side, NHK seems to actually present and address the real-life hikikomori issue. Poor cell quality in episdoes 4 (top) and 18 (bottom). In terms of visuals, you won't find anything spectacular here. There are in fact some flaws in the animation which are pretty hard to miss. The overall art style is mostly run-of-the-mill with a few episodes that clearly had some problems. These tend to often be budgetary issues as I understand it, but it has been some time since I have seen such crudely done cells in a contemporary production (more screenshots here, via Tyler Junky). Luckily those sequences tend to last for only a few minutes at a time, making them bearable. Some of the content also seems too belabored. This would fall under that "superficial content" category mentioned earlier. The first and foremost is perhaps rather central, being the whole Nihon Hikikomori Kyokai angle and the series' namesake. It is derived from a conspiracy theory which comes up time and time again as a metaphor that is truly developed all too late. While the motif is presented many times as comical, main characters continue to reference conspiracies in a way that almost tried my patience. I say almost because it wasn't a deal breaker by any means, yet it remains as a non-essential element that gets in the way of what is truly important. The real substance in NHK is to be found in its character development. Perhaps that is not saying much as this is true of any good story, especially those in episodic format. It comes to mind here because I do wish the creators had put more time into it. Less time on adding fantasy conspiracy theory sequences, and more time on the characters' actions and back stories. The protagonist and supporting characters are relatively well developed but the female lead is left a mystery for far too long. 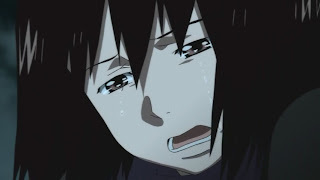 Creating suspense is one thing but providing little to no back story on Misaki's character for two-thirds of the series risks your audience loosing interest. Pointing out the animation problems, filler content, and under-developed characters is starting to make NHK sound like an anime not worth watching after all. That is far from the case here. It's precisely because I liked it so much and care that I would have loved to see it done better. These flaws are merely areas that could have been improved and pushed NHK toward greater success. Besides, none of its problems stood out so much that I didn't want to continue watching. When it comes down to it, this is a series that takes a good look at the otaku and hikikomori life-style and pokes a little fun at it. Not in a judgmental way but with a little Otaku No Video flare. It doesn't take itself too seriously and at the same time tries to present a message about the actual hikikomori phenomenon. 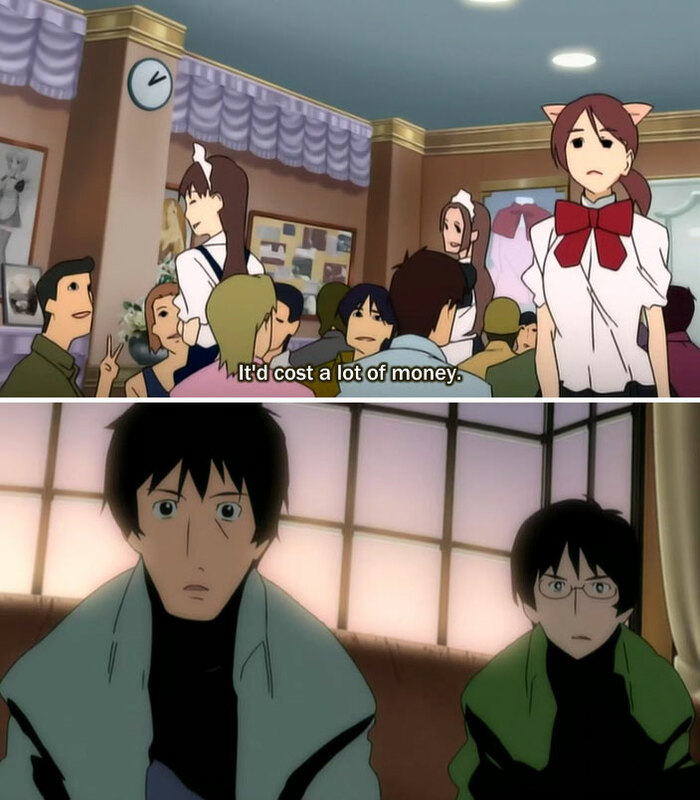 At one point NHK concludes that hikikomori exist because they are supported financially, only getting a job and re-joining the world when forced to support themselves. Either way, once you get past the superfluous content and execution issues, Welcome to the NHK becomes a captivating story whose characters can speak to you and touch your little otaku heart.